Coconut oil is filled with fatty acids and lauric acid that prevent hair from breaking and, thus, allow it to grow. Coconut oil penetrates hair follicles to not only moisturize them from within but also protect them from heat and environmental damage. Treating yourself to a coconut oil massage can stimulate the blood circulation in that area and, in turn, boost hair growth. This marvelous oil contains vitamin E, vitamin K and iron, and is also in possession of antifungal and antibacterial properties that protect against lice and dandruff that could slow your hair growth. The vitamin C content of lemon juice is essential for the production of collagen in your body. This collagen greatly affects the rate at which your hair grows. 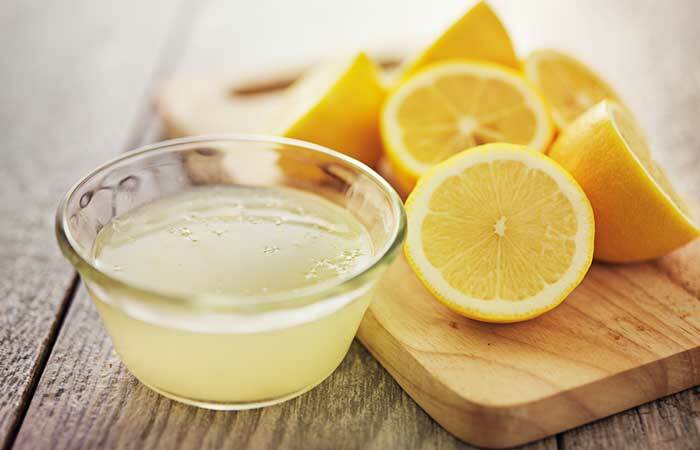 Lemon juice works excellently to cleanse hair follicles and unclog pores that could be inhibiting your hair growth. In fact, it is also known to reactivate hair growth from dormant follicles. It maintains scalp health as it has antifungal properties and controls the production of sebum. Lemon juice also curbs hair fall as its acidic nature helps tighten hair follicles. So now that you know how excellent coconut oil and lemon juice are for promoting hair growth, let’s look at how you can actually use these ingredients to pamper your tresses! So, now that we have established that coconut oil helps boost hair growth (thank you, Science), there’s only one thing left for you today – incorporate it into your daily routine! And here’s the easiest way to do it. Heat the coconut oil in a microwave for a few seconds. Massage the warm coconut oil onto your hair and scalp and leave it on overnight. Now this one’s for all my naturally oily haired ladies out there. 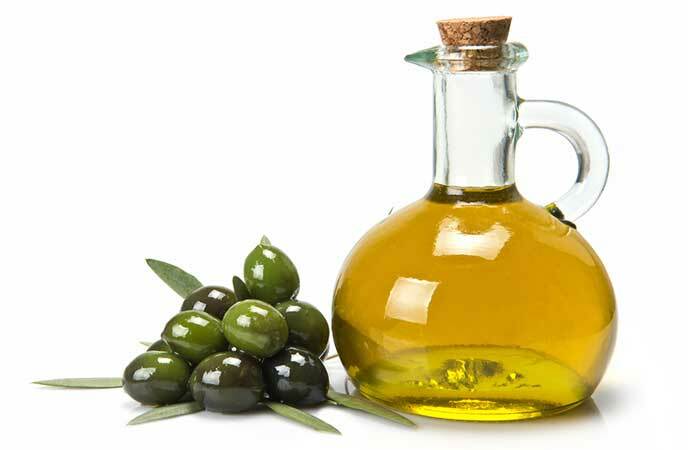 Applying any oil to hair that is already oily due to excessive sebum production will only make it greasier. This could result in limp hair that is prone to breakage. So, instead of massaging coconut oil onto your hair, you could use it with your shampoo or conditioner. Not only will you get all the benefits of coconut oil, it will also leave your hair feeling soft and shiny. Add the coconut oil to your bottle of shampoo or conditioner and mix it well. Use this coconut oil infused product every time you wash your hair. When it comes to oil treatments, coconut oil and olive oil are the all-rounder champions. A combination of these two oils works wonders in fighting dryness by moisturizing your scalp and conditioning your hair. Therefore, using this deep conditioning treatment will not only boost your hair growth but also give you soft, frizz-free hair. Mix the coconut oil and olive oil together in a glass bowl and heat it in a microwave for a few seconds. Massage this warm oil onto your hair and scalp. Soak the towel in hot water, wring out the excess water, and wrap it around your head. Leave the oil in for an hour before washing it off with a mild shampoo. Dry hair can be a real pain to take care of if you do not moisturize it on a daily basis. So, a coconut oil and honey hair mask is the perfect solution for this problem. Honey, being the amazing moisturizer and antibacterial that it is, works wonderfully with coconut oil to get rid of any scalp issues that could be causing hair fall. 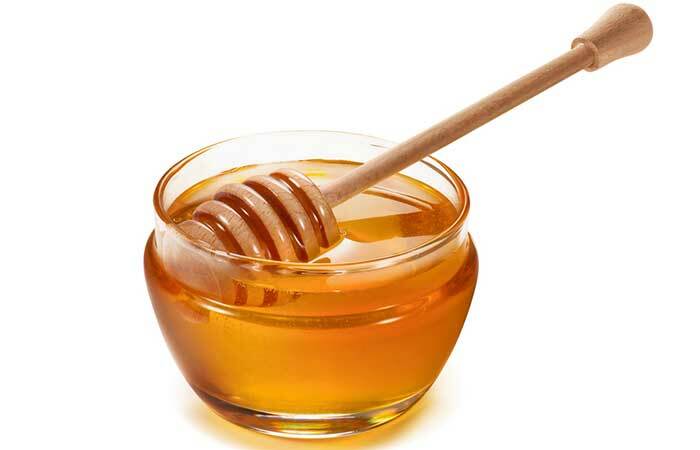 Mix the coconut oil and honey together and coat your hair with this mixture. Run a wide toothed comb through your hair to spread the mixture evenly. Put on a shower cap and leave this hair mask on for 40 minutes. One of the major hair conditions that causes hair fall and stunts hair growth would have to be dandruff. 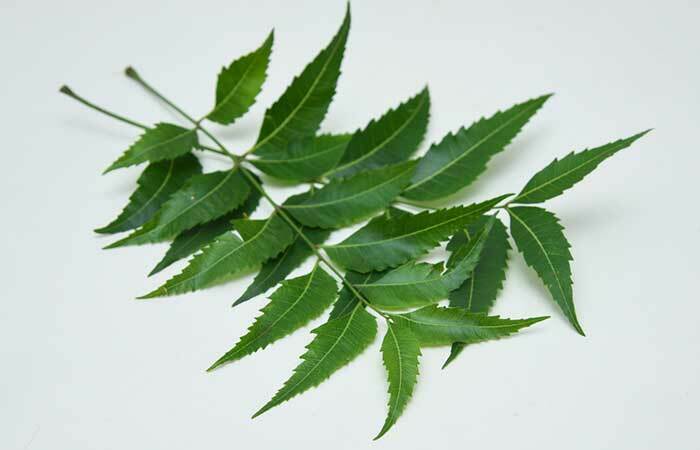 And neem is nothing short of magical at treating this problem thanks to its potent antibacterial power. 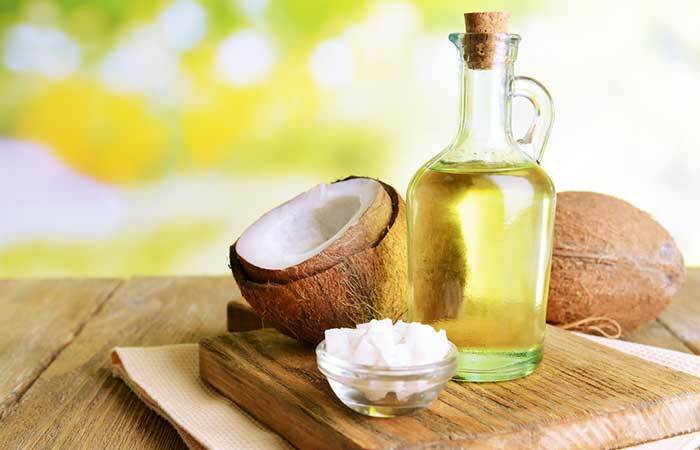 Coconut oil infused with neem leaves works especially well at getting rid of dandruff while conditioning your hair. Pour the water into the saucepan and place the glass bowl inside it to make a double boiler. Pour the coconut oil and neem leaf paste into the glass bowl and heat the mixture on the stove for about 15 minutes, until the oil has turned dark green. Keep stirring the mixture continuously. 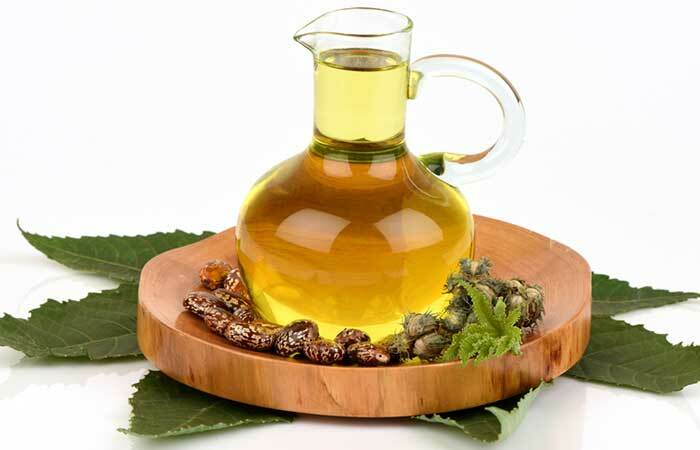 Strain out the neem leaf paste from the oil and store the oil in a glass jar. Massage this neem infused coconut oil onto your hair oil and leave it on for an hour or overnight before washing it off. 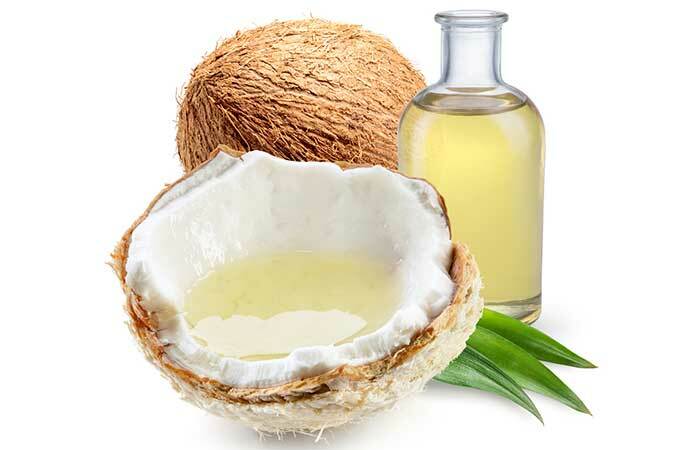 The best way to boost the hair growth property of coconut oil is to pair it with another oil. And tea tree oil is perfect for this job. When mixed with coconut oil, tea tree oil nourishes your hair right at the roots and unclogs your hair follicles to speed up your hair growth. Mix the coconut oil and tea tree oil together in a glass bowl and heat in the microwave for a few seconds. Apply this warm oil all over your hair and massage it onto your scalp for 10 minutes. Soak your towel with some hot water, wring it, and wrap it around your head. Leave the oil on for 20 minutes and then rinse it out with shampoo and conditioner. Now here’s an oil you thought you would never have any use for outside the pooja room. Camphor oil is actually great at stimulating your roots and fighting hair fall. Mixed with the moisturizing properties of coconut oil, it works as a potent treatment for boosting hair growth. Mix the coconut oil and camphor oil together in a bowl. 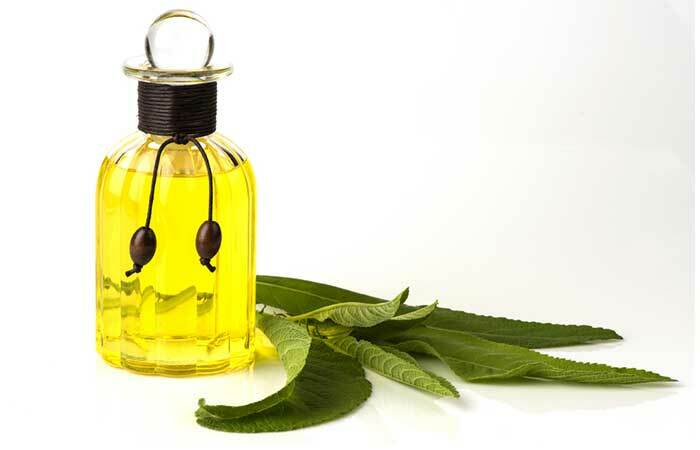 Massage this oil mixture onto your hair and scalp. Leave it on for 30 minutes before washing it off with shampoo. One of the major causes of hair fall and slow hair growth is dryness. And the only way to solve this problem is to provide your hair some intense moisture. All the 3 ingredients in this hair mask are great humectants that moisturize your hair to combat hair fall and boost hair growth. Mix the Greek yogurt, honey, and coconut oil together until they form a creamy consistency. Apply this hair mask all over your washed, damp hair. 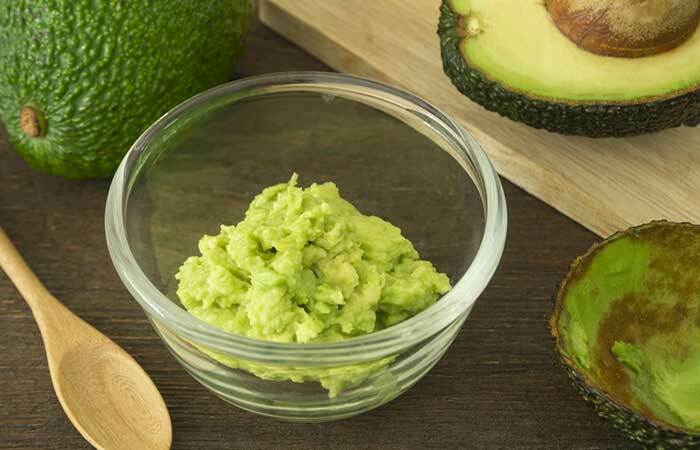 When it comes to taking stock of your hair’s health, there’s nothing better than a refreshing avocado-based hair mask. The vitamin B and E content of avocado works wonderfully with coconut oil and olive oil to repair split ends, nourish your hair, and stimulate hair growth. Scoop out one avocado and mash it along with coconut oil and olive oil until you have a smooth paste. Apply this hair mask all over your hair, from roots to tips. The thought of applying egg to your hair may not be the most pleasant, but once you do, there’s no turning back. You already know that coconut oil and honey hydrate and repair damaged hair. But, it’s the protein-rich egg yolk that not only promotes new hair growth but also speeds up the rate of growth. Whisk the coconut oil, honey, and egg yolk together in a bowl. Apply the hair mask all over your hair with a hair coloring brush. Massage your scalp with your fingers for a few minutes. Lemon juice may be a great ingredient to boost hair growth, but due to its acidic nature, it needs to be used in moderation. The easiest way to incorporate it into your daily hair care routine is to mix a little bit into your shampoo. Here’s how you need to go about it. Take 2-3 pumps of shampoo in the palm of your hand. Pour the lemon juice on top of it and gently mix it in with your finger. Do this every time you wash your hair. If you thought that all these two magic ingredients do is stimulate hair growth, you are gravely mistaken. When combined, they also fight dandruff, reduce itchiness in the scalp, make your hair soft, protect it from sun damage, and prevent it from thinning and greying. Mix the lemon juice and coconut oil together. Massage this mixture onto your scalp and throughout the length of your hair. Wash it off with a herbal shampoo and condition your hair. Now, as we all know, it’s best not to keep lemon juice in your hair for long periods of time due to its acidic nature. So, the safest and most convenient way that you can use it on your hair is as a hair rinse after you’ve washed your hair. Pour the lemon juice and water into a mug. After you’ve shampooed and conditioned your hair, slowly pour this lemon juice-water onto your head. Massage it into your scalp while doing so. Leave it on for 5 minutes before washing it out with water. We all know that lemon juice boosts collagen production that is responsible for hair growth. 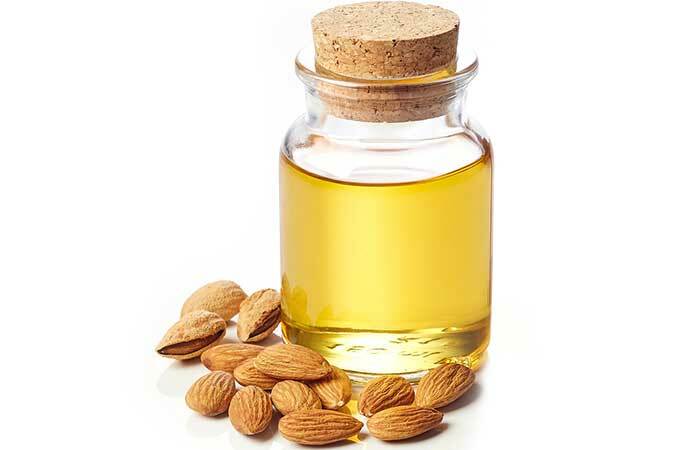 But combine it with almond oil, and you’ll get a host of more amazing benefits like improved blood circulation on your scalp and reduced hair loss, itchiness, and greasiness thanks to its fatty acid and vitamin E content. Mix the lemon juice and almond oil together in a bowl. Apply this mixture all over your hair and scalp. Massage it into your scalp for 5 minutes. Besides being unsightly, dandruff can also cause some serious irritation on your scalp that could lead to hair fall. Lemon juice and yogurt work wonderfully in conjunction to soothe your itchy scalp and remove excess oils to treat dandruff. This leads to improved follicular health, which, of course, means better hair growth. Mix the lemon juice and yogurt together until you have a smooth mixture. Wash it off with water and shampoo your hair as normal. Now, here’s another hair mask you can try out to treat dandruff-related hair fall and boost hair growth. Both lemon juice and neem leaves act as antifungal, antibacterial, and anti-inflammatory agents that fight the infection that could be causing your dandruff and reduce itchiness. This, in turn, aids hair growth. 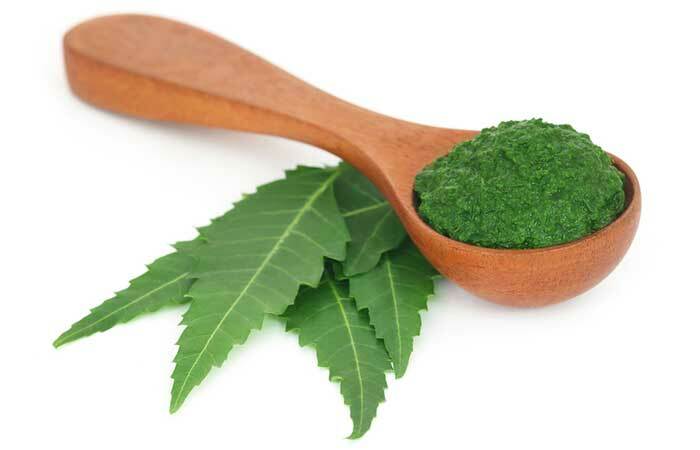 Grind enough neem leaves to obtain 4 tablespoons of paste. Mix the lemon juice with the neem leaf paste. Apply this paste all over your hair and massage it onto your scalp. Wash it off with warm water and shampoo. You may have used aloe vera gel on your face plenty of times but using it on your hair with lemon juice may sound weird. But the truth is the proteolytic enzymes, protein, and vitamins found in it help repair damaged cells on your scalp and nourish hair follicles to stimulate hair growth. 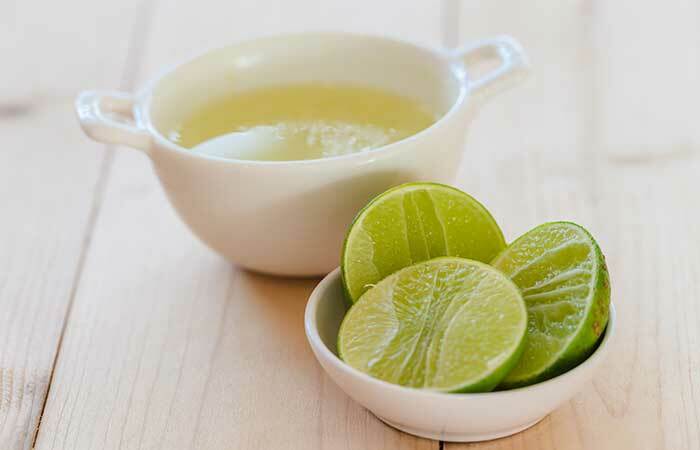 Mix the lemon juice and aloe vera gel together in a bowl. Apply this mixture all over your hair and massage it onto your scalp. Wash it off with shampoo and condition your hair as normal. Give your hair a boost with this power-packed hair treatment that you won’t be able to get enough of. The fatty acids and vitamins found in olive oil nourish and condition your hair while castor oil makes it thicker and stronger. Combined with lemon juice, they help boost hair growth exponentially. Mix the oils and lemon juice together in a bowl. Apply the mixture all over your hair and massage it onto your scalp for 10 minutes. Again, the idea of putting curry leaves on your hair may sound a bit off but here’s why you should do it – they are filled with amino acids and beta-carotene that strengthen your hair follicles and prevent hair fall and thinning. Along with lemon juice, they make for a truly nourishing and hair growth boosting hair pack. Blend the lemon juice, coconut oil and curry leaves together in a food processor until they form a thick paste. Apply the paste all over your hair and scalp. Wash it off with water and shampoo as usual. Though lemon juice works wonders in speeding hair growth, it can also dry out your hair pretty easily. So, the best way to use it is with natural humectants like honey and olive oil that can help retain the moisture in your hair. Mix the lemon juice, olive oil, and honey in a bowl until they are thoroughly combined. Apply the mask throughout the length of your hair and massage it onto your scalp. 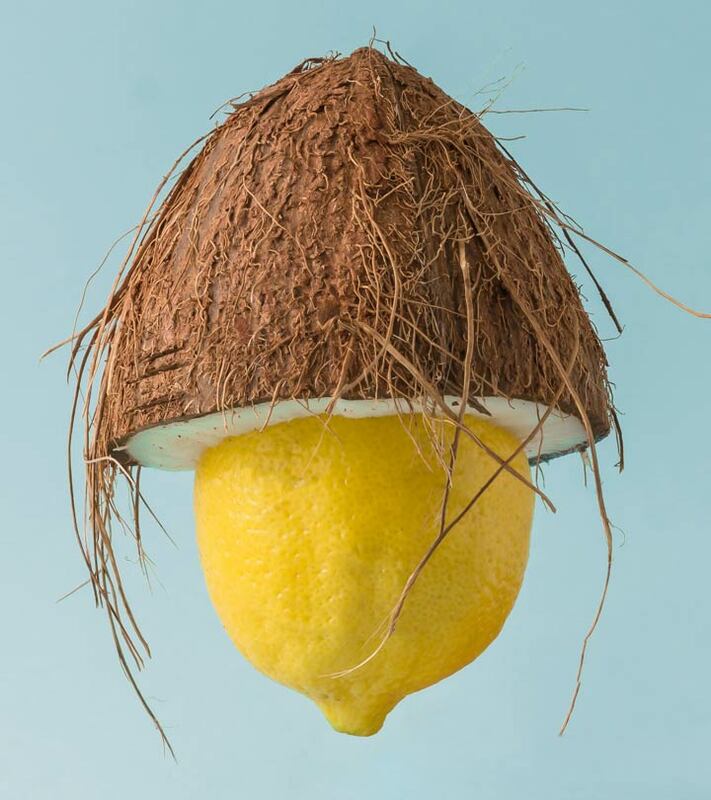 Always use virgin coconut oil and fresh lemon juice on your hair as the chemicals and preservatives in normal store-bought coconut oil and lemon juice for hair can do more harm than good. Lemon juice, being acidic in nature, should be applied with care. It’s best to use it in small amounts and only after diluting it with water or some other ingredient as it may cause irritation on your face and scalp. It is not prudent to apply lemon juice on your hair every day as it can strip it of its natural oils. Avoid heating up coconut oil in a microwave when preparing it for a hair mask as it will destroy its beneficial properties. Instead, pour some coconut oil in a glass bowl and place that bowl in a vessel full of hot water to heat it up. Avoid tying up your hair after massaging it with coconut oil. Leave it open to get better results. If you want the coconut oil conditioning treatment to be more effective, apply it on very damp hair. This will trap in the moisture and retain it in your hair for a longer time. 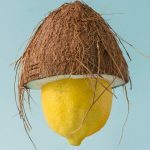 Though you may have slathered your hair with coconut oil regularly up to this point, you probably never even imagined that lemon juice could also be so good for boosting hair growth! But now that you do, try out these simple natural home treatments and comment below to let us know how it worked out for you! Yes, coconut oil can get rid of dandruff by moisturizing your scalp. What kind of coconut oil should you use on your hair? Organic and unrefined coconut oil is the best kind for using on your hair. Can coconut oil help your eyebrows and eyelashes grow? Yes, coconut oil can aid eyebrow and eyelash growth. Can lemon juice lighten your hair? Yes, lemon juice can lighten your hair if you leave it on for a long period of time and sit in the sunlight. How To Use Shikakai For Hair Growth? Mesotherapy For Hair Growth – Does It Work? Here’s the thing about carrots – they’ve been popular since time immemorial for improving your eyesight. But, carrots are also excellent for boosting hair growth and improving the overall health of your hair. 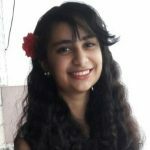 Read on to know how to use carrots for hair growth.